Military personnel are trained to be precise, hardworking and dedicated, but employers may miss out on critical ways to harness the unique strengths and skillsets of their Veteran hires. Green Zone training from DeVryWORKS provides guidance on how your company can better serve, understand and maximize the potential of our Military and Veteran hires. Our Green Zone training program is created to provide our corporate partners with resources and specialized support to enhance their Military hiring initiatives, awareness campaigns and internal resource groups. 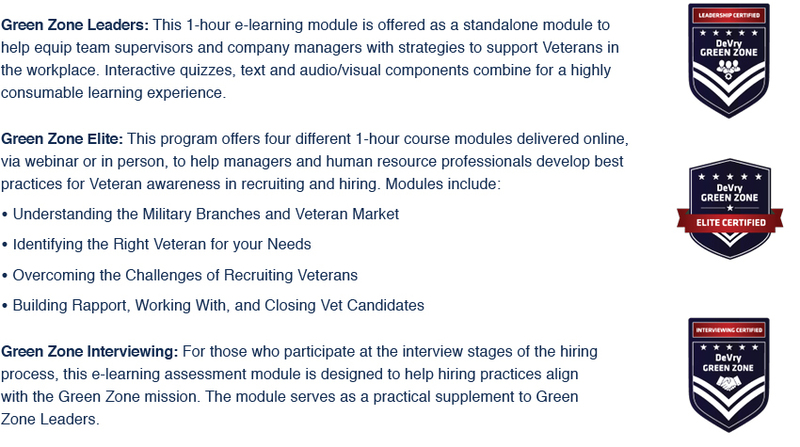 Convenience & Flexibility: Options include a 1-hour online course hosted on our Learning Management System, a collection of four 1-our modules which can also be delivered via webinar or in-person, and a targeted online assessment to examine Veteran-friendly interviewing techniques. Academic Standards: As the workforce solutions team of DeVry University, DeVryWORKS is not only a skills gap training provider, but can bring the higher education standards of an accredited university, and the emphasis on student care to our corporate education partners. Military Partnerships: DeVryWORKS is proud of its many education partnerships with branches across the U.S. Military, as well as its specialization in providing a pathway to education benefits for Military students and programs that support Veteran employees. Rank Structure Guides: Does your team know the difference between a Corporal and a Sergeant? Understanding what your Military hire has done helps you truly understand what they can do. Sensitivity Training: Your Military hire’s background may include overcoming the stigma of trauma or injury. Gaining insight into the challenges your new hire has faced helps you appreciate their strengths. Workplace Culture - From communication style to teamwork dynamics, know that a military hire is often equipped with a strong sense of how to lead, how to follow directions and how to cooperate. The DeVryWORKS Green Zone program offerings are intended to augment an organization’s Veteran hiring initiatives by delivering relevant, accessible content created in collaboration with Military Veterans and Fortune 500 partners. Participants who successfully complete any of the following three Green Zone components earn a badge and certificate to indicate they’ve mastered the competency. DeVryWORKS (DeVry University) is recognized by SHRM to offer Professional Development Credits (PDCs) for the SHRM-CPSM or SHRM-SCPSM. For more information about certification or recertification, please visit www.shrmcertification.org.